I can’t get away from it, even on vacation. For the past few days I’ve heard about the possibility of a snow storm Monday and so I’ve religiously gone to the computer and checked the numbers. Since I’ve been forecasting, one thing has changed more than everything else: The amount of data available. That’s good and bad, because even though you want more data you can drown in it. Recently I’ve started using a tool which makes analyzing the data a lot easier, BUFKIT. Not only is it fast and powerful… it’s free! If that weren’t enough, even the data to populate it is free. The program was originally designed to help the Weather Service’s Buffalo office in forecasting Lake Effect Snow. It was only after it had been written that anyone realized how important it could be. BUFKIT doesn’t replace what I’ve been using, it’s an enhancement. I’m trying to think of the best way to explain… and it’s not easy. A weather map can show a few parameters for a single point in time over a large area. 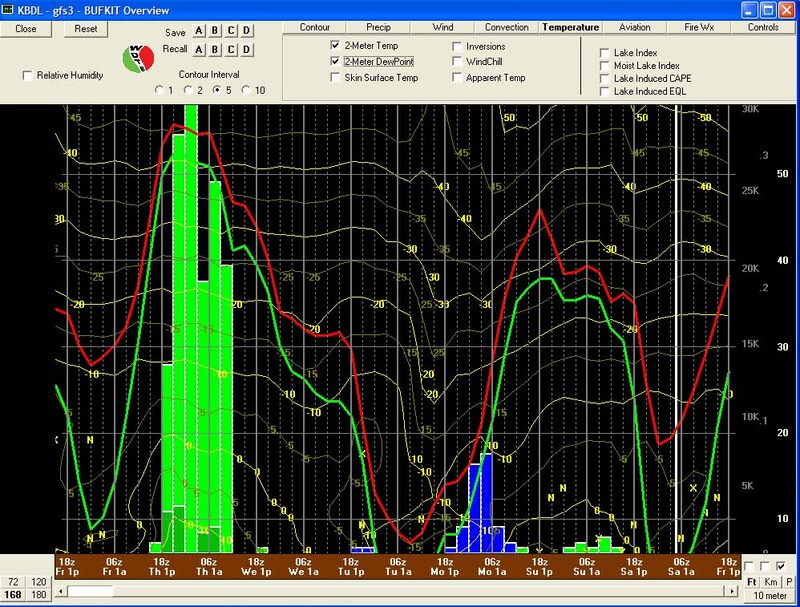 BUFKIT shows many parameters over a period of time for one specific geographic point. The real power is being able to switch data in and out as needed, on the fly. What is important in July might be worthless in January. What is important Monday might not matter Tuesday. I’ve included a sample BUFKIT screen, but without the ability to manipulate what you’re seeing, this image hardly does BUFKIT justice. Powerful programs aside, what does the data show for Monday? It does look like most people will wake to snow, though not a lot – a few inches north, less on the shoreline. Just as important, maybe more so, is the incredibly cold air and strong winds that will be in place by Monday night. Winter doesn’t officially start until Tuesday!